The Pilot Sport PS2 are what Michelin Tires calls their 'Ultimate Performance' tire. Used on many of the worlds fastest cars, the Pilot PS2 is said to offer an impressive mix of performance benefits for top sports car manufacturers (including Porsche, Mercedes-Benz, Bugatti, and Koenigsegg). Features on the Pilot PS2 include continuous varying groove angles that make the ride very smooth and quiet. Testimonials certainly support that claim of a quiet and comfortable ride. This pattern of groove angles are also said to improve handling. 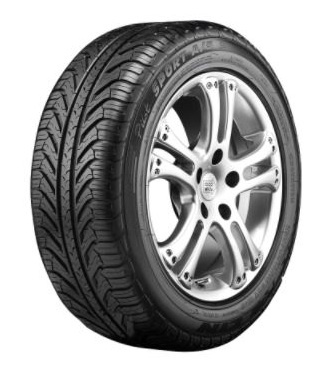 Click Here to get straight to the non-biased reviews of Michelin Tires Pilot Sport PS2. Or... read on for more about what Michelin and top retailers say about these tires. Hydroplaning is reduced in wet conditions because of extended grooves that extend from the center to the shoulder, while handling and braking is excellent because of shoulder blocks with multiple edges and added sipes. Reinforcement is added to the flat belt area of the tire in addition to a silica tread compound (high performance). Michelin says this provides a long tire life as well as improved handling at higher speeds. Online reviews support superior handling on these tires, but some have complained that the tread life of the Pilot Sport PS2 could be better. According to Michelin, the two distinct patters in the PS2's tread (as well as special tread compounds) bring the highest performance in its class in regards to both wet and dry driving conditions. "The PS2's are quiet and comfortable, as well as being very predictable... strong cornering performance... tread-wear has been very good considering my driving style, and I feel they are worth the money"
"These tires perform very well and acceleration is not bad for a street tire. They are stable at higher speeds and cornering as well. I have pushed these tires in rainy conditions and was happy with the handling. " "These Michelin tires have performed beyond our expectations for both in wet and dry driving conditions." "The PS-2s are quiet and are much more predictable than the Bridgestone's. Even if I get 20K miles out of them it would be worth it." "Far quieter than the regular Pilot Sports... a great ride"
"pricey, but you will enjoy the Michelin PS2's. They have been exactly what they were intended for." "These Michelin's wear quick, but are still much better than the Eagle F1 that I had before." "They are smooth and quiet but don't last for the price! I needed to replace these after nearly 13K miles. They are totally bald. They said I needed to replace them 3,000 miles ago but just couldn't do it for the money I paid for them. I found them to wear uneven as well. I rotated/balanced and aligned car during the last 12 months 3 times. So it is definitely the tires. Michelin would not honor replacement either." The PS2's from Michelin Tires are definitely not cheap, but they are in the realm of very high performance tires. The main complaints about these tires have been the high price (high $200's depending on tire size), and the potential for fast wear. The reviews on tire wear are mixed, so it likely boils down to driving style. There is no denying that these tires are rated very high in performance and handling, and owners all agree that the ride on the Michelin Pilot Sport PS2's is very quiet and smooth. If the price is just too high, you may consider looking at the Cooper CS4 as well.